Learn how to make the tedious process of querying ArangoDB with GraphQL easier for users so that they only have to define the GraphQL IDL file and simple AQL queries. The Apollo GraphQL project built a library that takes a GraphQL IDL and resolver functions to build a GraphQL.js schema. Resolve functions are called by GraphQL to get the actual data from the database. I modified the library in a way that before the resolvers are added, I read the IDL AST and create resolver functions. In order to simplify things and not depend on special "magic," let's introduce the directive @aql. With this directive, it's possible to write an AQL query that gets the needed data. With the bind parameter @current, it is possible to access the current parent object to do JOINs or related operations. This IDL describes a BlogEntry and an Author object. The BlogEntry holds an Author object that is fetched via the AQL query in the directive @aql. The type Query defines a query that fetches one BlogEntry. And with the fetched BlogEntry document, the corresponding Author is fetched via the AQL query defined in the directive. As a conclusion of this short demo, we can claim that with the usage of GraphQL's IDL, it is possible to reduce effort on the user side to query ArangoDB with GraphQL. For simple GraphQL queries and IDLs, it's possible to automatically generate resolvers to fetch the necessary data. The effort resulted in an npm package is called graphql-aql-generator. 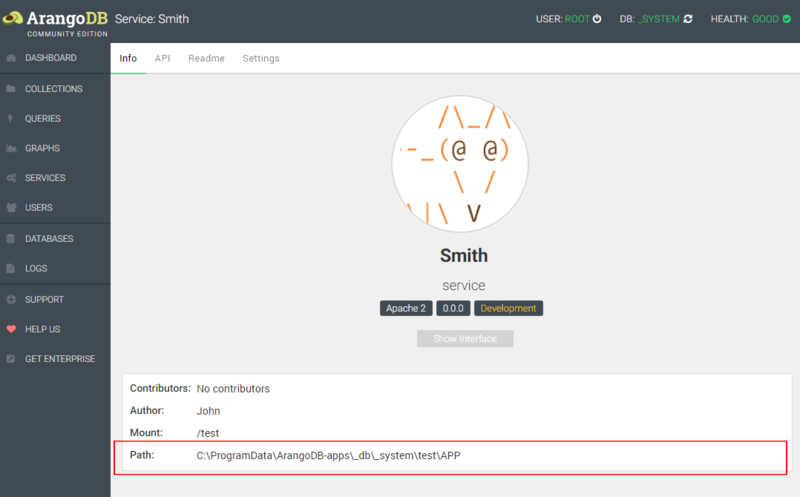 Open the ArangoDB web interface and navigate to SERVICES. Then click Add Service. 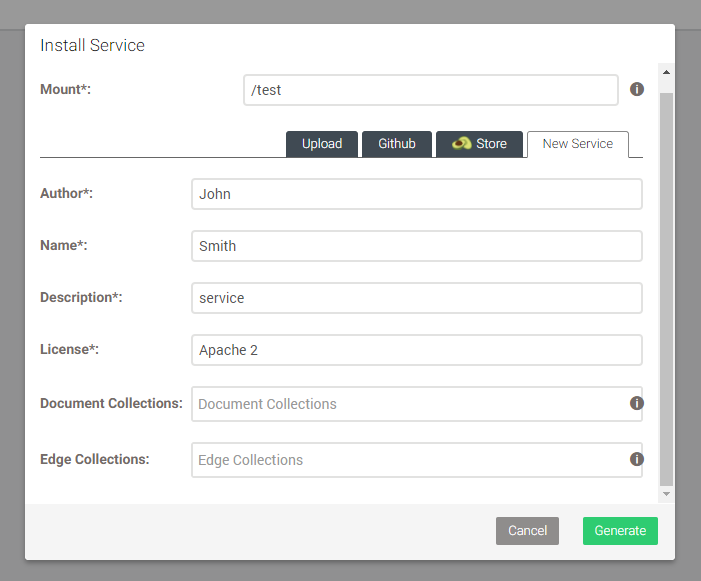 Select New Service and fill out all fields with *. Very important is the Mount field. I will use /test. Then click Generate. Click on the service to open its settings. Click Settings and then go to Set Development to enable the development mode. Then click Info and open the path at Path:. Foxx has a built-in GraphQL router that we can use to serve GraphQL queries. We assemble a new route called /graphql that serves the incoming GraphQL queries. With graphiql: true, we enable the GraphiQL explorer so we can test-drive our queries. Open 127.0.0.1:8529/test/graphql and the GraphiQL explorer is loaded so we can execute a query to fetch a BlogEntry with an Author. npm install graphql-aql-generator and create the collections and documents.